Reach thousands of constituents quickly and effectively with our Telephone Town Hall system. Our tool lets you define the issues and control the message using proactive outreach. On average 18-22 percent of those called will join a telephone town—10,000 auto-dials equates to 1,800 – 2,200 participants. 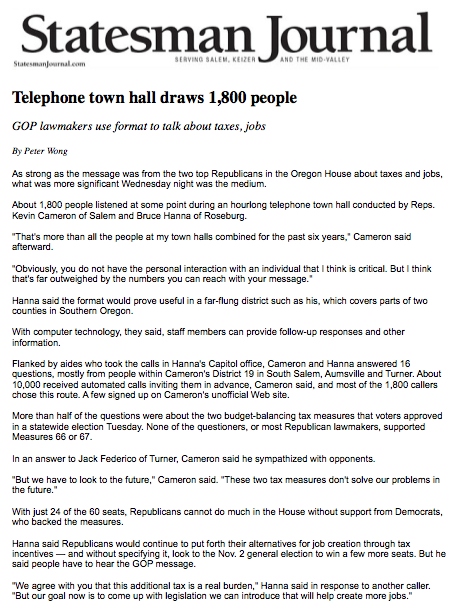 Compare that with traditional telephone town halls, where 15 – 25 people typically show up. All the sudden your ability to directly communicate with key constituencies is at a whole new level. The Telephone Town Hall System lets you hold live town hall meetings on the phone at the push of a button. Read our featured case study on telephone town halls. Listen to a Telephone Town Hall! Click here to listen to Oregon State Representative elect Mark Johnson’s recent telephone town. Rep. Johnson auto-dialed 14,100 phone numbers in his district, resulting in over 3,300 individuals joining his call about local job creation and education.